Thiochrome (2,7-dimethyl-5H-thiachromine-8-ethanol), an oxidation product and metabolite of thiamine, has little effect on the equilibrium binding of l-[3H]N-methyl scopolamine ([3H]NMS) to the five human muscarinic receptor subtypes (M1–M5) at concentrations up to 0.3 mM. In contrast, it inhibits [3H]NMS dissociation from M1 to M4 receptors at submillimolar concentrations and from M5 receptors at 1 mM. These results suggest that thiochrome binds allosterically to muscarinic receptors and has approximately neutral cooperativity with [3H]NMS at M1 to M4 and possibly M5 receptors. Thiochrome increases the affinity of acetylcholine (ACh) 3- to 5-fold for inhibiting [3H]NMS binding to M4 receptors but has no effect on ACh affinity at M1 to M3 or M5 receptors. Thiochrome (0.1 mM) also increases the direct binding of [3H]ACh to M4 receptors but decreases it slightly at M2 receptors. In agreement with the binding data, thiochrome does not affect the potency of ACh for stimulating the binding of guanosine 5′-O-(3-[35S]thiotriphosphate) ([35S]GTPγS) to membranes containing M1 to M3 receptors, but it increases ACh potency 3.5-fold at M4 receptors. It also selectively reduces the release of [3H]ACh from potassium-stimulated slices of rat striatum, which contain autoinhibitory presynaptic M4 receptors, but not from hippocampal slices, which contain presynaptic M2 receptors. We conclude that thiochrome is a selective M4 muscarinic receptor enhancer of ACh affinity and has neutral cooperativity with ACh at M1 to M3 receptors; it therefore demonstrates a powerful new form of selectivity, “absolute subtype selectivity”, which is derived from cooperativity rather than from affinity. Most receptor-active ligands bind to the same site as the endogenous ligand, the so-called orthosteric site. Agonists mimic the actions of the endogenous ligand, whereas antagonists physically prevent the endogenous ligand from binding but lack its actions. The property of a ligand that determines its effect when bound to a receptor is called its efficacy. Different degrees of efficacy lead to so-called full agonists, partial agonists with a smaller maximal effect than full agonists; neutral antagonists, which occupy the active site without exerting any effect; and inverse agonists, which reduce the activity of constitutively active receptors (Kenakin, 2002). The selectivity of an orthosteric ligand for one receptor or receptor subtype is determined by its affinity for the receptor and its efficacy at that receptor. The difference in affinity between the target receptor and other receptors must be large for an orthosteric ligand to have useful selectivity. This can be difficult to achieve for receptors that show close homology at the orthosteric binding region such as the five subtypes of muscarinic receptor (M1–M5) (Hulme et al., 1990). Selectivity derived from efficacy can also be hard to achieve, because the effect of a partial agonist depends on properties of the tissue, such as receptor density and downstream amplification mechanisms, which vary between cells and tissues, so a ligand with no apparent functional effect on tissues in vitro may nevertheless activate tissues in vivo, leading to unacceptable side effects (Terry et al., 2002). An alternative approach for developing selective ligands is to look for allosteric ligands that bind to a site on the receptor which is different from the site to which the endogenous ligand binds. This allows both types of ligand to bind simultaneously. If the affinity (or efficacy) of the endogenous ligand is different when it is bound to the allosteric liganded receptor compared with when it is bound to the free receptor, then the allosteric ligand exhibits positive or negative cooperativity with the endogenous ligand at that receptor. This is the mechanism by which benzodiazepine tranquilizers such as diazepam act: they enhance the affinity of certain GABAA receptors for GABA (Whiting, 2003). Many G-protein coupled receptors contain allosteric sites, and the best characterized are the muscarinic receptors for acetylcholine (ACh). An allosteric agent that enhances the affinity of ACh selectively at M1 receptors could provide a therapy for Alzheimer's disease (Lazareno et al., 1998; Birdsall et al., 1999). Like orthosteric ligands, allosteric ligands can achieve selectivity through their selective affinity for the target receptor. In addition, allosteric ligands also have the potential to show a more powerful form of selectivity, derived from cooperativity rather than affinity, which we have termed “absolute subtype selectivity” (Lazareno and Birdsall, 1995). Just as orthosteric ligands can be agonists, neutral antagonists, or inverse agonists, so allosteric ligands can have positive, neutral, or negative cooperativity with an orthosteric ligand; neutrally cooperative ligands bind to the receptor simultaneously with the orthosteric ligand but do not modify its affinity (or efficacy). If an allosteric ligand shows positive or negative cooperativity with the endogenous ligand at one receptor subtype but neutral cooperativity at the other receptor subtypes, then the allosteric ligand will only have the potential to modulate the activity at that one receptor subtype, regardless of its dose or concentration or its relative affinity for the target receptor. Here we report that thiochrome (Fig. 1), an oxidation product and metabolite of thiamine (Petrov, 1992), shows absolute subtype selectivity with regard to M1 to M4 receptors in allosterically enhancing the binding and actions of ACh at human M4 receptors. l-[N-methyl-3H]Scopolamine methyl chloride ([3H]NMS, 81–86 Ci/mmol) and [3H]choline chloride (82 Ci/mmol) were from Amersham Biosciences UK Ltd. (Little Chalfont, Buckinghamshire, UK), [3H]acetylcholine iodide (60–90 Ci/mmol) was from American Radiolabeled Chemicals (St. Louis, MO), [35S]GTPγS (1000–1400 Ci/mmol) was from PerkinElmer Life and Analytical Sciences (Boston, MA), and thiochrome (Fig. 1) and other compounds were from Sigma Chemical (Poole, Dorset, UK). Cell Culture and Membrane Preparation. CHO cells stably expressing cDNA encoding human muscarinic M1 to M5 receptors (Buckley et al., 1989) were generously provided by Prof. N. J. Buckley (University of Leeds, Leeds, UK). These were grown in α-minimal Eagle's medium (Invitrogen, Paisley, UK) containing 10% (v/v) newborn calf serum, 50 U/ml penicillin, 50 μg/ml streptomycin, and 2 mM glutamine, at 37°C under 5% CO2. Cells were grown to confluence and harvested by scraping in a hypotonic medium (20 mM HEPES + 10 mM EDTA, pH 7.4). In some cases, 5 mM sodium butyrate was added to the medium 24 h before harvesting to increase receptor expression. Membranes were prepared at 0°C by homogenization with a Polytron homogenizer (Kinematica, Littau-Lucerne, Switzerland)β followed by centrifugation (40,000g for15 min), washed once in 20 mM HEPES plus 0.1 mM EDTA, pH 7.4, and stored at -70°C in the same buffer at protein concentrations of 2 to 5 mg/ml. Protein concentrations were measured with the Bio-Rad reagent (Bio-Rad, Hemel Hempstead, UK) using bovine serum albumin as the standard. [3H]NMS Binding Assays. Unless otherwise stated, frozen membranes were thawed, resuspended in incubation buffer containing 20 mM HEPES, 100 mM NaCl, and 10 mM MgCl2, pH 7.4, and incubated with radioligand and unlabeled drugs for 2 h at 30°C in a volume of 1 ml. Membranes were collected by filtration over glass fiber filters (Whatman GF/B; Whatman, Maidstone, UK) presoaked in 0.1% polyethylenimine, using a Brandel cell harvester (Semat, Herts, UK), extracted overnight in scintillation fluid (ReadySafe; Beckman Coulter, High Wycombe, UK), and counted for radioactivity in LS6000 scintillation counters (Beckman Coulter). Membrane protein concentrations (5–50 μg/ml) were adjusted so that not more than approximately 15% of added radioligand was bound. Nonspecific [3H]NMS binding was measured in the presence of 10-6 M QNB (an antagonist with picomolar potency) and accounted for 1 to 5% of total binding. GTP was present at a concentration of 2 × 10-4 M in assays containing unlabeled ACh or as stated. Data points were usually measured in duplicate. CHO cell membranes do not possess cholinesterase activity (Lazareno and Birdsall, 1993; Gnagey and Ellis, 1996), so ACh could be used in the absence of a cholinesterase inhibitor. In some [3H]NMS binding assays, thiochrome was dissolved in dimethyl sulfoxide which, at a final concentration of 1%, seemed to have no effect on binding, but thiochrome was usually dissolved in water or buffer. [3H]ACh Binding Assays. Membranes containing M2 or M4 receptors (8–20 μg protein) were incubated with [3H]ACh in the absence and presence of thiochrome in incubation buffer in a final volume of 0.25 ml at 30°C for 30 min and were collected by filtration over glass fiber filters (Whatman GF/B) presoaked in 0.1% polyethylenimine. Total binding was measured in duplicate, and nonspecific binding in the presence of 10-6 M QNB was measured in singleton. To measure the reversibility of thiochrome binding, two sets of tubes, A and B, received 10 μl of M4 membranes and 10 μl of various concentrations of thiochrome at twice its final concentration (set A) or 10 μl buffer (set B). After 15-min incubation, 80 μlof[3H]ACh and 100 μl of buffer (set A) or thiochrome (set B) were added, and the incubation proceeded for a further 30 min. The final concentration of thiochrome in the set A tubes was therefore 10-fold less than the concentration to which the membranes were initially exposed. [35S]GTPγS Binding Assays. 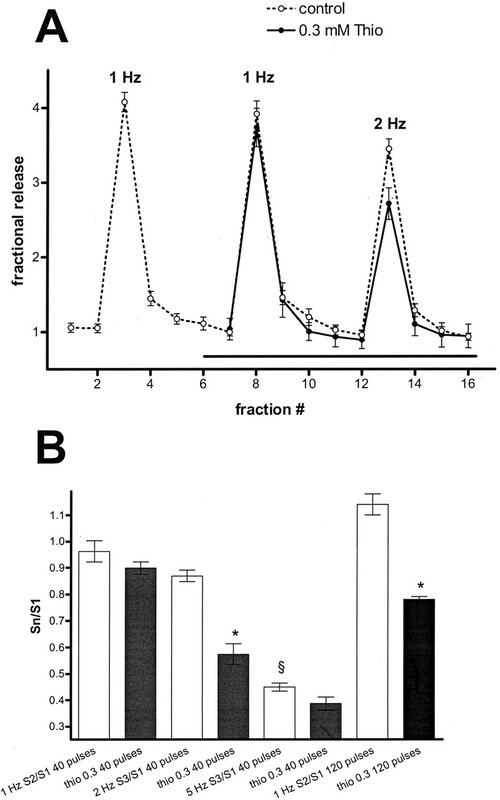 Membranes from CHO cells expressing muscarinic receptors M1 to M4 (5–20 μg/ml) were incubated with [35S]GTPγS (0.1 nM), GDP (10-7 M for M1 and M3 receptors, 10-6 M for M2 and M4) and ligands in incubation buffer in a volume of 1 ml for 30 to 60 min at 30°C. Bound label was collected over glass fiber filters prewetted with water. Thiochrome was dissolved in water or buffer, because when it was made up in dimethyl sulfoxide, it reduced stimulated [35S]GTPγS binding. Data Analysis. General data preprocessing, as well as the “affinity ratio” calculations and routine plots of the semiquantitative equilibrium assay, were performed using Minitab (Minitab Ltd., Coventry, UK). The other assays were analyzed with nonlinear regression analysis using the fitting procedure in SigmaPlot (SPSS Inc., Erkrath, Germany) or Prism 4 (GraphPad Software Inc., San Diego, CA). where BLAX is observed specific bound radioligand, L, A, and X are concentrations of [3H]NMS, ACh, and allosteric agent, respectively, KL, KA, and KX are affinity constants for the corresponding ligands and the receptor; α and β are allosteric constants of X with [3H]NMS and ACh, respectively; and n is a logistic slope factor to describe the binding of ACh. where BL is binding in the presence of the low [[3H]NMS] alone; BL1 is binding in the presence of the high [[3H]NMS]; BLA is binding in the presence of the low [[3H]NMS] and ACh; BLX is binding in the presence of the low [[3H]NMS] and a particular concentration of test agent; BLAX is binding in the presence of the low [[3H]NMS], ACh, and the same concentration of test agent; L is the low [3H]NMS concentration; L1 is the high [3H]NMS concentration; and q is the ratio of low and high [3H]NMS concentrations, L/L1. Off-Rate Assay to Estimate the Affinity of Thiochrome for the [3H]NMS-Occupied Receptor. A high concentration of membranes (2–4 mg protein/ml) was incubated with a high concentration of [3H]NMS (5 nM) for approximately 15 min. Then 10-μl aliquots were distributed to tubes that were empty or contained 1 ml of 10-6M QNB alone and in the presence of a number of concentrations of thiochrome (typically n = 4). Nonspecific binding was measured in separately prepared tubes containing 10 μl of membrane and 2 μl of [3H]NMS plus QNB. Some time later, approximately 2.5 dissociation half-lives, the samples were filtered. The data were transformed to observed rate constants, koffobs, using the formula koffobs = ln(B0Bt)/t, where B0 is initially bound radioligand and Bt is bound radioligand remaining after t min dissociation. These values were expressed as a percentage of the true [3H]NMS dissociation rate constant koff (koffobs in the absence of allosteric agent) and fitted to a logistic function using nonlinear regression analysis. Theoretically the curves should have slopes of 1 and mirror the occupancy curves of the allosteric agents at the [3H]NMS-occupied receptors, regardless of whether the change of [3H]NMS dissociation is caused by an allosteric change in the shape of the receptor or the trapping of the [3H]NMS in its binding pocket by the bound allosteric agent (Lazareno and Birdsall, 1995). Initially the curve was fitted without constraints. If the slope factor was not different from 1, and the maximal effect (Emax) was not less than 0, then the slope was constrained to 1 and the Emax was fitted. If the fitted Emax was less than 0 dissociation (a physical impossibility, apart from experimental variation or error) then the Emax was constrained to 0 and the slope fitted. Brain Slice Superfusion. Wistar male rats, 2 to 3 months old, were killed by cervical dislocation and decapitation. Striata and hippocampi were dissected, and slices were prepared using a McIlwain-type tissue chopper set at the slice width 0.35 mm. Next, 10 to 12 striatal slices or 20 to 24 hippocampal slices were prelabeled with 10 μCi of [3H]choline in 2 ml of Krebs' buffer (final concentrations, 123 mM NaCl, 3 mM KCl, 1 mM MgSO4, 1.3 mM CaCl2, 1.2 mM NaH2PO4, 25 mM NaHCO3, and 10 mM glucose, saturated with 95% oxygen/5% CO2, pH 7.3–7.4) for 30 min at 37°C. The slices were then washed in fresh buffer and loaded into a six-chamber superfusion apparatus (one slice per chamber for striatal slices and two slices per chamber for hippocampal slices) and superfused using Krebs' buffer containing 10 μM hemicholinium-3 (to prevent reuptake of choline) at a rate of 0.5 ml/min and at 37°C. After a 1-h washout period, 4-min samples of superfusate were collected, and the outflow of radioactivity was determined using liquid scintillation counting and expressed as a percentage of radioactivity present in the slice at the beginning of the respective collection period. The evoked release of radioactivity represents the release of labeled ACh (Richardson and Szerb, 1974; Dolezal et al., 1992; Dolezal and Tucek, 1998, 1999), whereas the resting liberation of radioactivity represents a mixture of labeled choline and its metabolites. The release of ACh was stimulated by potassium depolarization (1-min superfusion with medium containing 50 mM potassium chloride, iso-osmotically replaced at the expense of sodium chloride, at the beginning of the third and the ninth fraction) or by electrical stimulation (2-ms rectangular monopolar pulses with a current strength of 35 mA at the beginning of the 3rd, 8th, and 13th fractions; for details of frequency and number of pulses, see figure legends). Tested drugs were added to the superfusion medium 8 min before the second or third stimulation as indicated and remained present until the end of superfusion. The evoked release of ACh was calculated as the release of radioactivity over background by subtracting values immediately preceding (B1) and after the evoked liberation. The influence of drugs on the evoked release of radioactivity was estimated from the changes of the ratio second or third stimulation (S2 or S3; in the presence or absence of tested drugs)/first stimulation (S1; always the control stimulation). Thiochrome (Fig. 1) had only small effects on the equilibrium binding of [3H]NMS to M1 to M5 receptors (Fig. 2). It also had little effect on [3H]NMS binding in the presence of ACh at M1, M2, M3, or M5 receptors. At M4 receptors, however, in the presence of ACh, thiochrome inhibited [3H]NMS binding (Fig. 2), suggesting that thiochrome allosterically enhanced the affinity of ACh at M4 receptors. This effect is seen more clearly when the data are transformed into affinity ratios, i.e., the apparent affinity of ACh in the presence of thiochrome divided by its apparent affinity alone (Fig. 2B): according to the allosteric model, the EC50 of the affinity ratio plot corresponds to the Kd of thiochrome at the free receptor, and the asymptotic value corresponds to the cooperativity of the system. It can be seen that thiochrome had little effect on ACh affinity at M1,M2,M3,orM5 receptors but increased it up to 4-fold at M4 receptors. The effect of thiochrome on the potency of ACh at M4 receptors was studied in more detail (Fig. 3A), and it was found that thiochrome increased the potency of ACh without affecting the slope of the inhibition curves. The data from Figs. 2 and 3A and similar assays were fitted to the allosteric model, and the parameter estimates are shown in Table 1. Thiochrome had no effect at M5 receptors at concentrations up to 3.10-4 M and had a log affinity of approximately 4 at M1 to M4 receptors, although the errors in the parameter estimates were relatively large at M1 to M3 receptors because of the small effects of thiochrome on [3H]NMS binding both in the absence and presence of ACh. Thiochrome had neutral or low negative cooperativity with [3H]NMS at M1 to M4 receptors and neutral cooperativity with ACh at M1-M3 receptors; it had 4-fold positive cooperativity with ACh at M4 receptors. These assays were conducted in the presence of 2.10-4 M GTP, but thiochrome also increased ACh potency at M4 receptors in the absence of GTP (Fig. 3B). GTP reduced the potency of ACh and increased the slope to a similar extent in the absence and presence of thiochrome, whereas thiochrome increased the potency of ACh to a similar degree in the absence and presence of GTP. A, effect of thiochrome on [3H]NMS binding to M1 to M5 receptors alone and in the presence of a fixed concentration of ACh. Individual data points are shown. The lines in the plots for M1 to M4 receptors were derived from nonlinear regression to the allosteric model. B, affinity ratios with ACh. Affinity ratios were calculated as described under Materials and Methods. At M1 to M5 receptors, the concentrations of [3H]NMS were 0.20, 0.42, 0.21, 0.16, and 0.84 nM, respectively; the estimated Kd values were 0.12, 0.46, 0.19, 0.08, and 0.72 nM, respectively; the fixed concentrations of ACh were 22, 1, 10, 3, and 13 μM, respectively. 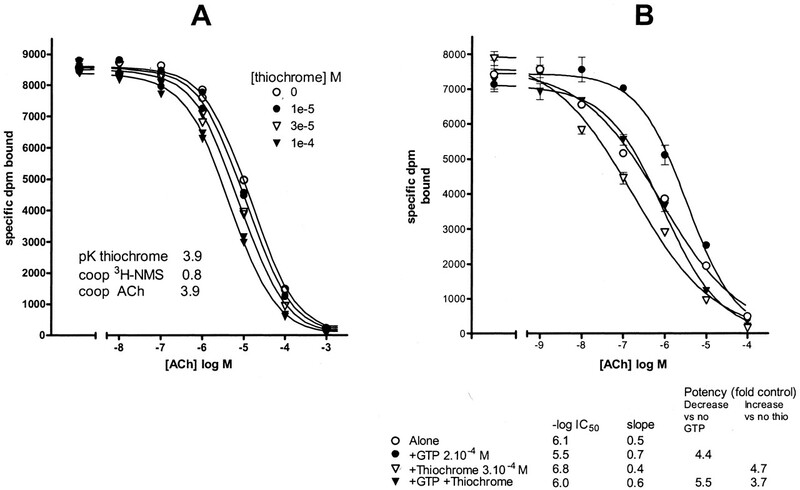 A, effect of increasing concentrations of thiochrome on the inhibition by ACh of 0.32 nM [3H]NMS binding to M4 receptors in the presence of 2.10-4 M GTP. Individual data points are shown. Parameters were estimated by nonlinear regression to the allosteric model, and the lines were derived from the fit. B, effect of 3.10-4 M thiochrome on the inhibition by ACh of 0.24 nM [3H]NMS binding to M4 receptors in the absence and presence of 2.10-4 M GTP. The points are mean ± range/2 of duplicate observations. Parameters were estimated by nonlinear regression to a logistic function, and the lines were derived from the fit. Parameter estimates of thiochrome binding from equilibrium assays with [3H]NMS and ACh Parameters (mean ± S.E.M.) were estimated from fitting assays such as those shown in (Figs. 2 and 3A to the allosteric model using nonlinear regression analysis. Thiochrome was inactive at M5 receptors at concentrations up to 0.3 mM, the highest concentration used in these assays (n = 2). The slope factor for thiochrome binding was fixed at 1. pK is log affinity (M—1) of thiochrome for the free receptor; Coop NMS is the estimate of the cooperativity of thiochrome with [3H]NMS, and Coop ACh is the estimate of the cooperativity of thiochrome with ACh. n indicates the number of assays. Like most other allosteric agents at muscarinic receptors, thiochrome inhibited the dissociation of [3H]NMS essentially completely (Fig. 4, Table 2). It showed similar potencies at M1, M2, and M4 receptors, a slightly lower potency at M3 receptors, and much lower potency at M5 receptors. According to the allosteric model, the IC50 of thiochrome for this effect corresponds to the Kd of thiochrome for the [3H]NMS-occupied receptor. In theory, the same parameter can be estimated from the equilibrium assays summarized in Table 1; the comparison between the two estimates is shown in Table 2. Where there is a clear signal, at M4 receptors in the presence of ACh, the predicted affinity at the [3H]NMS-occupied receptor differs less than 2-fold from the value measured directly in the off-rate assay, supporting the allosteric model as the mechanism underlying both sets of observations. It should be noted, however, that the slopes of the curves in off-rate assays were greater than 1, whereas the allosteric model predicts slopes of 1. Effect of thiochrome on the dissociation of [3H]NMS from M1 to M5 receptors measured at a single time. For M1 to M5 receptors in this assay, the times were 20, 4, 25, 25, and 45 min, respectively, and the dissociation rate constants (koff) were 0.061, 0.35, 0.059, 0.055, and 0.023 min-1, respectively, corresponding to dissociation half times of 11, 2, 12, 13, and 30 min, respectively. The points are mean ± range/2 of duplicate observations, and the lines were derived from nonlinear regression to a logistic function. Parameter estimates for these and similar experimental data are summarized in Table 2. Parameter estimates from [3H]NMS off-rate assays Parameters for the inhibition of [3H]NMS dissociation measured at a single time were derived from fitting three assays such as those shown in Fig. 4 to a logistic function. pEC50 is —log of the concentration causing 50% of the maximal effect; according to the allosteric model it corresponds to the log affinity of thiochrome for the [3H]NMS-occupied receptor. Emax is the dissociation rate constant of [3H]NMS, expressed as a percentage of control, in the presence of a saturating concentration of thiochrome. Predicted indicates the pEC50 value predicted by multiplying the mean estimates of affinity and the cooperativity with [3H]NMS from the equilibrium assays summarized in Table 1. The binding of [3H]ACh can be measured only at M2 and M4 receptors in the high ionic strength buffer used here. In the absence of GTP, [3H]ACh binds to the high-affinity, G-protein bound form of the receptor. 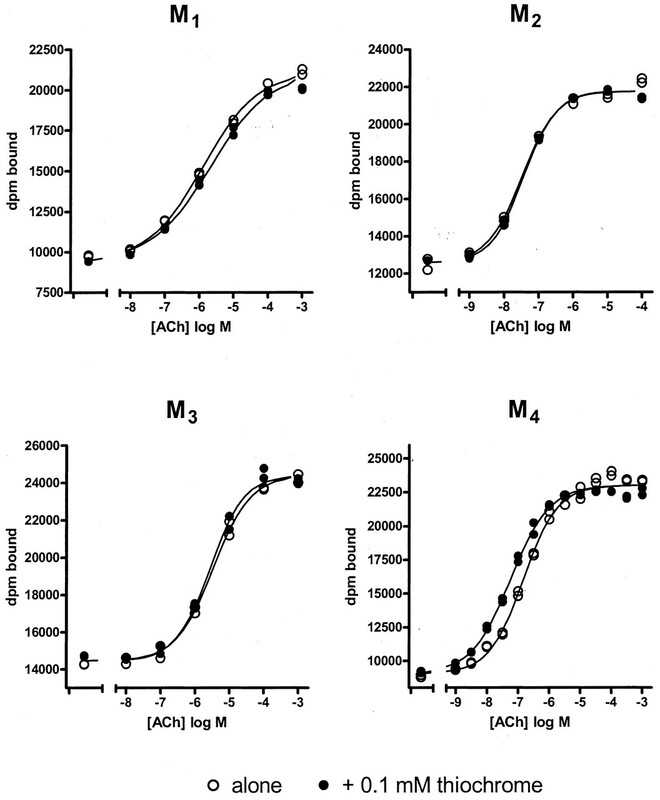 Thiochrome increased the binding of low concentrations of [3H]ACh approximately 2-fold to the M4 receptor but decreased [3H]ACh binding to the M2 receptor by approximately 20% (Fig. 5A). In saturation assays with [3H]ACh (Fig. 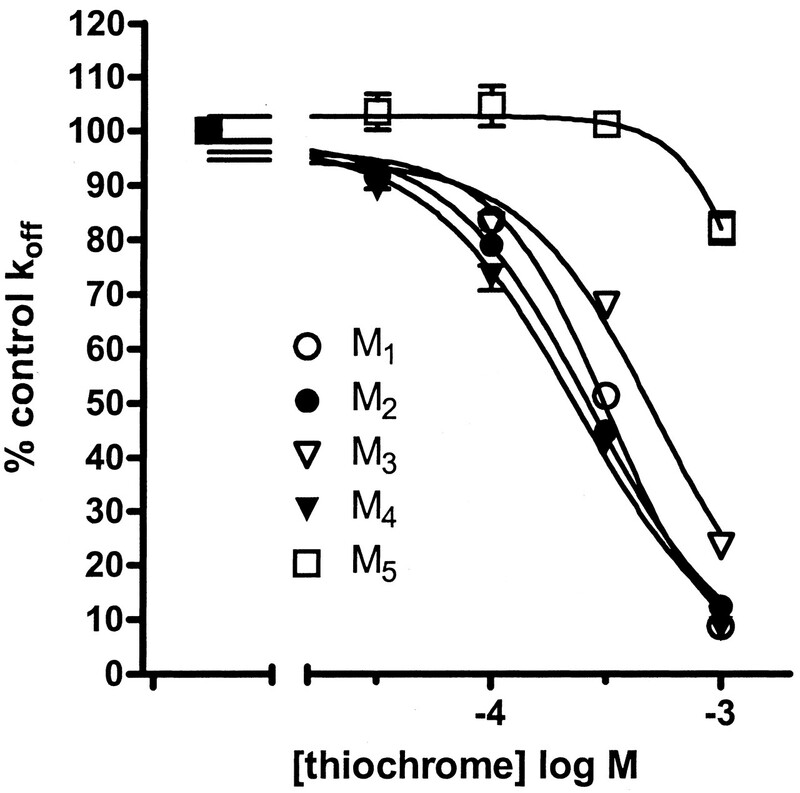 6), 10-4 M thiochrome had little effect at M2 receptors and decreased the Kd at M4 receptors by approximately 50% (see legend to Fig. 6). Binding of thiochrome to M4 receptors was fully reversible (see legend to Fig. 5B). A, effect of thiochrome on the binding of [3H]ACh to M2 (1.1 nM) and M4 (4.3 nM) receptors. The points are the mean and range/2 of duplicates, and the lines show the fits to a logistic function with slope fixed at 1. The data obtained with 1 mM thiochrome were not included in the analysis. From this assay and similar ones, the pEC50 of thiochrome was 4.6 ± 0.3 (n = 2) at M2 receptors and 4.4 ± 0.1 (n = 7) at M4 receptors. The asymptotic effect as a fraction of initial binding was 0.8 ± 0.1 at M2 receptors and 1.9 ± 0.1 at M4 receptors. B, the reversibility of thiochrome binding to M4 receptors was measured as described under Materials and Methods. When membranes were initially preincubated with thiochrome and then diluted 10-fold (•), the apparent potency of thiochrome (in terms of the concentration at first exposure) was 9.7 ± 0.7-fold (n = 5) less than in the undiluted samples (○), indicating that thiochrome bound reversibly. The data shown are from a single assay. Saturation analysis of [3H]ACh binding to M2 and M4 receptors in the absence and presence of 10-4 M thiochrome. The lines in the top correspond to the fit of each individual saturation curve to a one-site model. The lines in the bottom correspond to the simultaneous unconstrained fit of both curves. From four such assays, at M2 receptors, thiochrome caused a nonsignificant 2 ± 7% decrease in Bmax and a nonsignificant 12 ± 12% increase in Kd from 1.7 to 1.9 nM (-log Kd from 8.77 ± 0.05 to 8.73 ± 0.08), whereas at M4 receptors, thiochrome caused a nonsignificant 18 ± 11% increase in Bmax and a significant 39 ± 13% reduction in Kd from 6.2 to 3.4 nM (-log Kd from 8.21 ± 0.03 to 8.46 ± 0.12) (p < 0.05, one-tailed t test). In all M4 assays, sharing Bmax values did not result in a significantly worse fit than in the unconstrained condition, although in three of four unconstrained fits, there was a small but significant increase in Bmax (29 ± 6%, p < 0.05, n = 3). Many, although not all, of the Hofstee plots were curvilinear, suggesting that [3H]ACh binding to M2 and M4 receptors may be more complex than a simple one-site model. The effect of 10-4 M thiochrome on the stimulation by ACh of [35S]GTPγS binding to membranes containing muscarinic receptors is shown in Fig. 7. Thiochrome (made up in water or buffer, see Materials and Methods) did not affect basal activity, the slopes of the curves, or the maximal effect of ACh. Thiochrome increased ACh potency by 2- to 5-fold at M4 receptors and did not affect ACh potency at the other receptor subtypes. Effect of 10-4 M thiochrome on ACh stimulation of [35S]GTPγS binding to membranes containing M1 to M4 receptors. Individual data points are shown, and the lines come from logistic fits with basal, Emax, and slope factor shared between the curves in the absence and presence of thiochrome. From a number of similar assays, the potency ratios of ACh in the presence of 10-4 M thiochrome (EC50 alone divided by EC50 in the presence of thiochrome) were the following (mean ± S.E.M., n): M1, 0.9 ± 0.3, 2; M2, 1.4 ± 0.3, 3; M3, 1.1 ± 0.1, 2; and M4, 3.5 ± 0.6, 6. An additional assay at M4 receptors yielded a potency ratio of 15. Only at M4 receptors was the potency ratio significantly different from 1 (p < 0.01). To study the effect of thiochrome in a more physiological preparation, we measured its effects on ACh release from superfused brain slices. In the first set of experiments, we investigated the effect of thiochrome on 50 mM potassium stimulation-evoked liberation of ACh from rat striatal cholinergic interneurones, which have been shown to possess inhibitory presynaptic M4 muscarinic receptors (Dolezal and Tucek, 1998; Zhang et al., 2002). Depolarization with 50 mM potassium directly depolarizes nerve terminals and precludes the propagation of action potentials. As shown in Fig. 8A, thiochrome inhibited the evoked release of ACh in a concentration-dependent manner by 15 and 25% at concentrations of 0.3 and 1 mM, respectively. The inhibitory effect on release was mediated by muscarinic receptors because it was abolished by the muscarinic receptor antagonist N-methylscopolamine (NMS). Thiochrome at a concentration of 1 mM slightly but significantly attenuated basal outflow of radioactivity by 15% (Table 3). For this reason, it was used in the subsequent experiments at a concentration of 0.3 mM, which significantly inhibited the evoked release of ACh but did not influence the basal outflow of radioactivity. Effect of thiochrome on the potassium-evoked release of ACh from striatal (A) and hippocampal (B) slices. The release of ACh was evoked by 50 mM KCl as described under Materials and Methods. The changes in the evoked release of ACh in the presence of indicated drugs (shaded columns) are expressed as changes of S2/S1 ratio and are compared with control superfusions in the absence of drugs (□). A, thiochrome (thio) at concentrations of 0.3 and 1 mM decreased the evoked release of ACh from striatal slices. The inhibitory effect of 0.3 mM thiochrome was abolished by 1 μM NMS. B, 0.3 mM thiochrome had no significant influence on the potassium-evoked release of ACh from hippocampal slices either in control conditions or in the presence of a high concentration (100 μM) of carbachol (car), whereas carbachol alone significantly inhibited the release of ACh both in the presence and absence of thiochrome, and NMS significantly increased the release of ACh. ⋆, p < 0.01 from control (analysis of variance followed by Dunnett's multiple comparison test). S1 as the percentage of tissue content was 14.50 ± 0.83 (41) in striatum and 2.04 ± 0.18 (47) in hippocampus. The number of observations is indicated in Table 3. The influence of thiochrome on the resting outflow of radioactivity from striatum and hippocampus An effect of drugs is given as a ratio of resting efflux expressed as fractional basal release (B2 and B1) immediately before S2 and S1, respectively. B1 (percentage of tissue content) was 1.30 ± 0.04 (41) for striatum and 1.00 ± 0.04 (47) for hippocampus. Data represent mean ± S.E.M. of the number of observations given in parentheses. The release of ACh in hippocampus, which is innervated by cholinergic neurons from basal forebrain, is regulated by presynaptic muscarinic receptors of the M2 subtype (Allen and Brown, 1993, 1996; Kitaichi et al., 1999a,b; Zhang et al., 2002). Thiochrome at a concentration of 0.3 mM did not influence either resting outflow of radioactivity (Table 3) or potassium stimulation-evoked release of ACh (Fig. 8B). The functionality of inhibitory muscarinic receptors was shown by the 40% inhibition of evoked release in the presence of 0.1 mM carbachol. The concentration of ACh at the receptors was sufficient to exert an inhibitory effect, as shown by the increase in evoked release in the presence of NMS. To discriminate between a direct agonist action and an indirect allosteric effect (increasing the affinity of the muscarinic receptor for endogenous ACh), we investigated the influence of thiochrome on the release of ACh from striatal slices evoked by a fixed number of electrical pulses delivered at increasing frequencies (Fig. 9A). At a concentration of 0.3 mM, thiochrome had no influence on the release of ACh evoked by 40 pulses delivered at 1 Hz, whereas it inhibited the release when stimulated at a frequency of 2 Hz. The release of ACh was strongly autoinhibited when evoked by stimulation at a frequency of 5 Hz, and in this case, thiochrome had no further significant effect on the release (Fig. 9B). Apparently, shorter spacing of action potentials results in an increased residual concentration of ACh in the synaptic cleft at the time when the next action potential reaches the terminal, and at a certain level, it enables the allosteric potentiation of ACh action at M4 muscarinic receptor by thiochrome to be manifest. Influence of thiochrome on the electrical stimulation-evoked release of ACh from striatum at different frequencies. A, the slices were stimulated three times by 40 pulses as described under Materials and Methods. S1 and S2 stimulations were delivered at 1 Hz and S3 stimulation at 2 Hz. The results are expressed as fractional release (ordinate). Each point represents mean ± S.E.M. of six values obtained in two independent experiments. Thiochrome (•), which was present in the superfusion medium from the sixth fraction till the end of the superfusion, had no effect on the release of ACh evoked at a frequency of 1 Hz (S2) but significantly inhibited ACh release evoked at a frequency of 2 Hz (S3). B, influence of thiochrome (▪) on the evoked release of ACh is expressed as Sn/S1 ratios (ordinate) and compared with control superfusions in its absence. With 40 pulses delivered, thiochrome had no effect on ACh release when evoked by 1 Hz stimulation (the first pair of columns; S2/S1), decreased the release evoked by 2 Hz stimulation (the second pair of columns; S3/S1), and had no effect on the release triggered by 5 Hz stimulation (the third pair of columns, S3/S1), which itself significantly decreased the release compared with 2-Hz stimulation. With 120 pulses delivered at 1 Hz, thiochrome decreased ACh release (the fourth pair of columns; S2/S1). Columns represent mean ± S.E.M. of three to nine values obtained in one to three independent experiments. ⋆, p < 0.01 from corresponding control (t test); §,p < 0.01 from 2 Hz stimulation during S3 (t test). When stimulated with 40 pulses at 1 Hz, S1 (as the percentage of tissue content) was 3.28 ± 0.10 (18), and with 120 pulses at 1 Hz, S1 was 7.71 ± 1.12 (6). The inhibitory effect of thiochrome on the electrically evoked release of ACh depended not only on the frequency of stimulation but also on the duration of stimulation (Fig. 9). The inhibitory effect of thiochrome on ACh release was also found when the stimulation at 1 Hz was prolonged to 120 pulses, perhaps because the longer stimulation resulted in a small increase of residual ACh in the synaptic cleft. This article characterizes the subtle effects of thiochrome on muscarinic receptors. By a number of criteria, thiochrome seems inactive at muscarinic receptors. It has little or no effect on equilibrium [3H]NMS binding at any receptor subtype, nor on the potency or efficacy of ACh at M1, M2, M3, or M5 receptors (Figs. 2 and 7). However its inhibition of [3H]NMS dissociation from M1 to M4 receptors, presumably by binding to the [3H]NMS-occupied receptors, provides evidence that thiochrome probably does bind to these subtypes under equilibrium conditions. 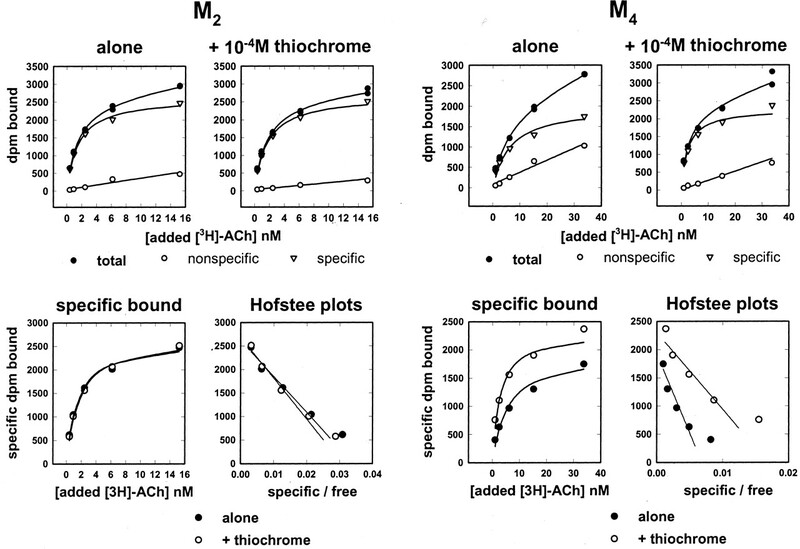 The major effect of thiochrome on equilibrium binding is the 3- to 5-fold increase in the apparent affinity of ACh to compete with [3H]NMS binding at M4 receptors, both in the presence and absence of GTP (Fig. 3B). This effect is not an artifact because it is subtype-specific and it can be seen in other types of assay: thiochrome increases the direct binding of [3H]ACh to M4 receptors (Figs. 5 and 6) and increases the functional potency of ACh to stimulate [35S]GTPγS binding (Fig. 7) and inhibit ACh release from striatal nerve endings via M4 receptors (Figs. 8 and 9). The behavior of other allosteric agents at muscarinic receptors is generally consistent with the simple ternary complex model, in which the endogenous ligand (or a different orthosteric ligand) can bind simultaneously with an allosteric ligand at the receptor, and the difference in affinity of the orthosteric ligand for the free and allosteric liganded receptors constitutes the cooperative effect. One test of consistency is that the affinity of the allosteric agent for [3H]NMS-liganded receptors should be the same whether it is measured directly in an off-rate assay or indirectly as the product of affinity and cooperativity with [3H]NMS from equilibrium assays. Thiochrome partly survives this test. The comparison between the two estimates is shown in Table 2, and it can be seen that only at M4 receptors is there good consistency between the two parameter estimates. This is probably caused by the very small effects of thiochrome on [3H]NMS binding ± ACh at M1 to M3 receptors (Fig. 2), leading to inaccurate parameter estimates (thiochrome was inactive in equilibrium studies at M5 receptors). Where there is a clear signal, at M4 receptors in the presence of ACh, the log affinity of thiochrome at free M4 receptors was estimated with more precision, and the predicted affinity at the [3H]NMS-occupied receptor differs less than 2-fold from the value measured directly in the off-rate assay, supporting the allosteric model as the mechanism underlying both sets of observations. One result that is not compatible with the simple allosteric model is the relatively steep slope of the curves describing the inhibition of [3H]NMS dissociation from M1 to M4 receptors. Other allosteric ligands have been found to bind with steep slopes, including tacrine, Duo3, and a series of pentacyclic compounds (Potter et al., 1989; Gharagozloo et al., 2002; Tränkle et al., 2003), and explanations such as binding to both the orthosteric and allosteric sites, binding to two or more allosteric sites, and the involvement of receptor dimerization have been suggested to account for the phenomenon. In one respect, however, the behavior of these compounds is different from that of thiochrome, because they have steep slopes in equilibrium assays as well as in off-rate assays, whereas the curves of thiochrome increasing both the affinity of ACh in competition with [3H]NMS at M4 receptors and the binding of [3H]ACh to M4 receptors are consistent with a slope of 1 (Figs. 2, 3A, and 5). It is possible that the highest concentration of thiochrome used in the off-rate assays, 1 mM, has nonspecific effects on [3H]NMS dissociation in addition to its allosteric effect. The effects of thiochrome on the saturation binding of [3H]ACh to M2 receptors were small and nonsignificant. At M4 receptors, where the effects were larger, the Bmax was never significantly altered by thiochrome, although there was a trend for a small increase, and the Kd was reduced by 40 to 50%. An effect of thiochrome on the Kd of [3H]ACh is consistent with the simple allosteric model, whereas a lack of effect on Bmax may indicate that thiochrome does not alter the efficacy of ACh; if the Bmax were increased by thiochrome, then this might imply that thiochrome had increased the affinity of the ACh-occupied receptor for the G protein, which could in turn lead to an increase in the efficacy of ACh (Tota and Schimerlik, 1990). Thiochrome also acts as a selective allosteric enhancer of ACh at rat, as well as human, M4 receptors. Rat striatum is known to contain presynaptic M4 receptors, which inhibit ACh release, whereas the autoinhibitory presynaptic muscarinic receptors in rat hippocampus are of the M2 subtype. Thiochrome inhibited ACh release from striatum stimulated by 50 mM KCl in a concentration-dependent manner, without affecting basal release (at concentrations lower than 1 mM), and the effect was blocked by NMS, indicating the involvement of muscarinic receptors. This effect had to occur at the level of presynaptic terminals because high potassium stimulation does not allow the spreading of action potentials. In contrast, thiochrome had no effect in hippocampus, although the directly acting agonist carbachol was effective in reducing release, and endogenous ACh was active at the inhibitory receptors because the antagonist NMS increased release. When ACh release from striatum was elicited electrically, thiochrome was ineffective at inhibiting release caused by 40 pulses at a frequency of 1 Hz, whereas release elicited by 2 Hz stimulation was strongly inhibited, as was the release caused by 120 pulses at 1 Hz. With 5-Hz stimulation, ACh release was strongly autoinhibited, and thiochrome did not cause further significant inhibition. These results demonstrate that thiochrome was not acting as a direct agonist but required the continuing presence of non-saturating concentrations of ACh at the receptor to be effective. In conclusion, thiochrome may not bind to M5 receptors but does seem to bind weakly to muscarinic M1 to M4 receptors. It enhances the affinity of ACh 3- to 5-fold at M4 receptors only, while having negligible effects on ACh at the other four muscarinic receptor subtypes. Physiological consequences of this property were observed in rat striatum, where thiochrome enhanced the effect of neuronally released ACh. Despite its low potency and lack of selective affinity for M1 to M4 receptors, thiochrome shows absolute receptor subtype selectivity as an allosteric enhancer of ACh affinity at M4 receptors and may prove to be a useful tool in the characterization of functional muscarinic responses. This work was funded by Sankyo Co. Ltd, Tokyo, Japan, the Medical Research Council, United Kingdom, and the Grant Agency of the Czech Republic. V.D. was supported by grants GACR 305/01/0283 and 309/02/1331 (research project AVOZ 5011922). ABBREVIATIONS: ACh, acetylcholine; NMS, N-methyl scopolamine; [3H]NMS, l-[N-methyl3H]Scopolamine; thiochrome, 2,7-dimethyl-5H-thiachromine-8-ethanol; [35S]GTPγS, guanosine 5′-O-(3-[35S]thiotriphosphate); CHO, Chinese hamster ovary; QNB, quinuclidinyl benzilate; S1, first stimulation; S2, second stimulation; S3, third stimulation. Allen TG and Brown DA (1993) M2 muscarinic receptor-mediated inhibition of the Ca2+ current in rat magnocellular cholinergic basal forebrain neurones. J Physiol 466: 173-189. Allen TG and Brown DA (1996) Detection and modulation of acetylcholine release from neurites of rat basal forebrain cells in culture. J Physiol 492 (Pt 2): 453-466. Birdsall NJM, Farries T, Gharagozloo P, Kobayashi S, Lazareno S, and Sugimoto M (1999) Subtype-selective positive cooperative interactions between brucine analogs and acetylcholine at muscarinic receptors: functional studies. Mol Pharmacol 55: 778-786. Buckley NJ, Bonner TI, Buckley CM, and Brann MR (1989) Antagonist binding properties of five cloned muscarinic receptors expressed in CHO-K1 cells. Mol Pharmacol 35: 469-476. Dolezal V, Jackisch R, Hertting G, and Allgaier C (1992) Activation of dopamine D1 receptors does not affect D2 receptor-mediated inhibition of acetylcholine release in rabbit striatum. Naunyn Schmiedeberg's Arch Pharmacol 345: 16-20. Dolezal V and Tucek S (1998) The effects of brucine and alcuronium on the inhibition of [3H]acetylcholine release from rat striatum by muscarinic receptor agonists. Br J Pharmacol 124: 1213-1218. Dolezal V and Tucek S (1999) Calcium channels involved in the inhibition of acetylcholine release by presynaptic muscarinic receptors in rat striatum. Br J Pharmacol 127: 1627-1632. Ehlert FJ (1988) Estimation of the affinities of allosteric ligands using radioligand binding and pharmacological null methods. Mol Pharmacol 33: 187-194. Gharagozloo P, Lazareno S, Miyauchi M, Popham A, and Birdsall NJM (2002) Substituted pentacyclic carbazolones as novel muscarinic allosteric agents: synthesis and structure-affinity and cooperativity relationships. J Med Chem 45: 1259-1274. Gnagey A and Ellis J (1996) Allosteric regulation of the binding of [3H]acetylcholine to M2 muscarinic receptors. Biochem Pharmacol 52: 1767-1775. Hulme EC, Birdsall NJM, and Buckley NJ (1990) Muscarinic receptor subtypes. Annu Rev Pharmacol Toxicol 30: 633-673. Kenakin T (2002) Efficacy at G-protein-coupled receptors. Nat Rev Drug Discov 1: 103-110. Kitaichi K, Day JC, and Quirion R (1999a) A novel muscarinic M4 receptor antagonist provides further evidence of an autoreceptor role for the muscarinic M2 receptor sub-type. Eur J Pharmacol 383: 53-56. 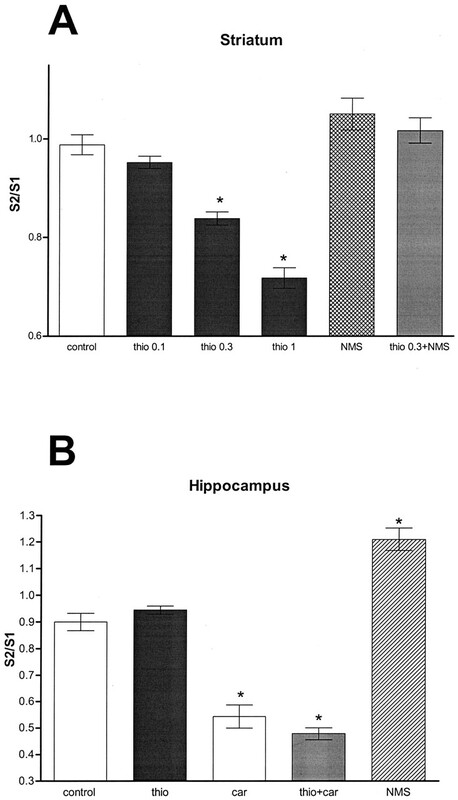 Kitaichi K, Hori T, Srivastava LK, and Quirion R (1999b) Antisense oligodeoxynucleotides against the muscarinic M2, but not M4, receptor supports its role as autoreceptors in the rat hippocampus. Brain Res Mol Brain Res 67: 98-106. Lazareno S and Birdsall NJM (1993) Estimation of competitive antagonist affinity from functional inhibition curves using the Gaddum, Schild and Cheng-Prusoff equations. Br J Pharmacol 109: 1110-1119. Lazareno S and Birdsall NJM (1995) Detection, quantitation and verification of allosteric interactions of agents with labeled and unlabeled ligands at G protein-coupled receptors: interactions of strychnine and acetylcholine at muscarinic receptors. Mol Pharmacol 48: 362-378. Lazareno S and Birdsall NJM (2000) Measurement of competitive and allosteric interactions in radioligand binding studies, in G Protein-Coupled Receptors (Haga T and Berstein G eds) pp 1-48, CRC Press, Boca Raton. Lazareno S, Gharagozloo P, Kuonen D, Popham A, and Birdsall NJM (1998) Subtype-selective positive cooperative interactions between brucine analogues and acetylcholine at muscarinic receptors: radioligand binding studies. Mol Pharmacol 53: 573-589. Petrov SA (1992) Thiamine metabolism in mouse organs and tissues in vivo and in vitro. Fiziol Zh 38: 79-85. Potter LT, Ferrendelli CA, Hanchett HE, Hollifield MA, and Lorenzi MV (1989) Tetrahydroaminoacridine and other allosteric antagonists of hippocampal M1 muscarine receptors. Mol Pharmacol 35: 652-660. Richardson IW and Szerb JC (1974) The release of labelled acetylcholine and choline from cerebral cortical slices stimulated electrically. Br J Pharmacol 52: 499-507. Terry AV, Buccafusco JJ, Borsini F, and Leusch A (2002) Memory-related task performance by aged rhesus monkeys administered the muscarinic M1-preferring agonist, talsaclidine. Psychopharmacology (Berl) 162: 292-300. 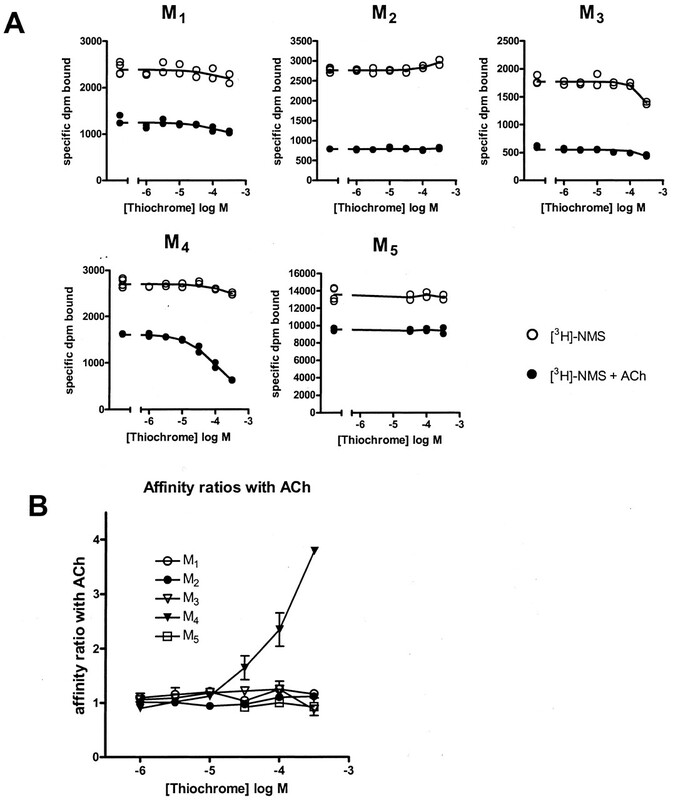 Tota MR and Schimerlik MI (1990) Partial agonist effects on the interaction between the atrial muscarinic receptor and the inhibitory guanine nucleotide-binding protein in a reconstituted system. Mol Pharmacol 37: 996-1004. Whiting PJ (2003) GABA-A receptor subtypes in the brain: a paradigm for CNS drug discovery? Drug Discov Today 8: 445-450. Zhang W, Basile AS, Gomeza J, Volpicelli LA, Levey AI, and Wess J (2002) Characterization of central inhibitory muscarinic autoreceptors by the use of muscarinic acetylcholine receptor knock-out mice. J Neurosci 22: 1709-1717.